If you’re serious about your essential oils, then you have one for every occasion. Rather than leave them as a messy cluster on your dresser where you have to hunt down the right one when you want to use them or clinking in a drawer where they may be easily broken, there are a few ways to display and organize your collection. In order to maintain quality, essential oil are almost exclusively available in dark amber glass containers. Several factors can lead to your essential oils losing potency as time passes. The darker glass filters light and help to extend the life of your essential oil by protecting it from the sun. As nice as this protection is, it still makes for a very fragile way to store things. A rack is an easy way to keep your bottles from taking an unfortunate tumble off your table, leaving you with a very sweet smelling mess on your floor or clothes. Something with a slightly padded interior would protect your glass if the shelf ever fell, as well as keeping them snuggled in securely, so nothing is jolted out of place by the force of the impact. A rack may also be useful for holding the bottles if the hole is deeper, even if it makes it harder to read the labels. Essential oils have so many uses that it seems impossible to have just one. You may have several you prefer to use for your most common daily issues only to have to face the additional pain of searching through a large number of bottles clattering around in a drawer to find the exact mix of you want. Some essential oil displays would allow you to access the labels of the bottles from either the side or the top, depending on your organization preference. They could then be arranged in a way that suited you, to assist in keeping your favorites at hand. In addition to protecting your bottles from spills and breakage, your shelf should be made of a material that won’t scratch the glass or labels. The exterior should be of a sturdy construction in case it should take a fall itself, but the interior which holds the bottles should be lined with something to prevent abrasions and even make a snug, comfortable fit. This rack itself may suffer from spills so a solid, impermeable material would be a good choice and can even make clean up an easier chore. You may find a large selection of racks is made of plastic for this reason. Does it seem like your essential oil collection tends to multiply while you aren’t looking? What began with one or two little bottles has quickly grown to encompass entire drawers. You may want to consider shelves that seem oversized now but will accommodate all those bottles that seem to just appear on your table. Expanding racks or versatile compartments may save you from having to buy another rack in the future as your essential oil supply grows. You may also want to consider the size of the bottles you typically purchase. If they are always pretty similar, a tray with molded holes may suffice, but if you trade between tiny bottles and larger versions of your favorites, then something with a little more changeability is the way to go. If you’re looking for an essential oil display which is robust yet simple, the Luxurious Shades Stone Display may be what you are looking for. This essential oil display is carved from stone making it tough and yet intended to be attractive enough to have sitting out in your living room, letting you have access to your essential oils anywhere in your home. A separate mixing tray is included to make it easy for you to create your own custom essential oil mixes without needing to purchase anything else. The smooth stone makes for a quick and easy cleanup since the stone does not absorb the oil. If you intend to be able to move this display from room to room, the weight may be a factor. Since it is a softer type of stone that is easy to carve, it can also more likely to fracture if it ever happens to be dropped. It may cause injury as well if it happens to fall on a foot. Fitting just as easily on the top of your dresser as inside an unused drawer, this metal-frame holder may be just what you need to organize your collection. Rounded grooves keep your bottles from rolling into each other and sit at an angle made to make label reading easy. These grooves may keep your bottles from rolling away onto the floor, but they don’t make for a very secure ride if you have to move them. The bottle rests gently on top of the metal, and a solid bump could send them rolling right off. Holds 35 5ml round bottles up to 7/8" diameter. A very unique and attractive display centerpiece. 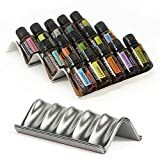 This rotating storage rack can make it easy to get to your essential oil bottles with a simple spin. The bottles are all held upright, which is helpful for preventing leakage, and the bottle space fits around the middle of the bottle. This may interfere with reading the side labels, depending on the design of your labels. There is no padding inside the hole or on the bottom so your labels may be scratched on the sides and the carousel itself may be damaged by the bottles being removed and replaced frequently. However, it may hold them more securely when you want to move the carousel from one location to another. With three staggered rows, this handcrafted rack may make it easy to view the labels on all your essential oils. There are multiple grooves inside each bottle place so you can store large and small bottles all on the one rack. There are three different stain options for the wood, which may support a more natural feel to your home. Caution may be needed when moving the rack since they sit in a fairly shallow hole. This makes it easy to read the labels but does not secure the bottles completely. To meet the varied needs of a serious essential oils user, the Simply Shelf Expandable Holder may be the way to go. Not only does it recline the bottles in such a way as to be able to see the labels clearly, but the grooves are also able to hold a variety of differently sized bottles. The shelf is also of a low enough profile to fit into drawers so you can expand your storage space beyond the tops of dressers and tables. You could utilize space that may have otherwise been wasted. Other essential oils trays require more and more area, especially if they want to display a large number of bottles. While it may not be completely secure for transporting, the shelf seems to make it easy to re-arrange as needed simply by connecting it to another frame. This also has the bonus of being able to fit additional shelves to hold your fast-growing collection. The metal frame may seem simple, but it can also make for quick cleanup if any spills occur. Though plastic and stone may also resist staining, they can be damaged if dropped. Your bottles may receive some scratching without padding, but it should be minimal compared the convenience you may experience.